“Yesterday, I had to help — because it is a moral imperative to help — a school about 45 minutes from San Juan that still has no water, no electricity and no milk for their children,” the mayor, Carmen Yulín Cruz, said at the Latino Victory Summit, a gathering of Latino leaders and activists that seeks to boost the number of Hispanics in elected office. The Federal Emergency Management Agency (FEMA) said in a statement that commercial supplies of food and water have been re-established in Puerto Rico and that private suppliers are “sufficiently available that FEMA commodities are no longer needed for emergency operations." The supplies were scheduled to end Wednesday; Washington's decision to end aid to the island was first reported by NPR. FEMA said most grocery stores are open, as are transportation systems, gas stations, banks and ATMs. FEMA staging areas are still open and have provisions for local mayors to obtain for their citizens, FEMA said. "The reality is that we just need to look around. Supermarkets are open, and things are going back to normal," Alejandro De La Campa, FEMA's director in Puerto Rico, told NPR. De La Campa said that if FEMA is giving out free food and water, that competes with the grocery stores and hurts the economy, which needs to be jump-started to help long-term recovery. But Cruz disagreed that the situation has improved as much as FEMA said. “While I’m standing here with you there are children without food in Puerto Rico,” Cruz said at the summit. "There is a need in Puerto Rico, and we ask the president to, for once, do the right thing and not take the aid away from Puerto Rico," said Cruz who invited by Sen. Kirsten Gillibrand, D-N.Y., to attend President Donald Trump's first State of the Union address on Tuesday night. 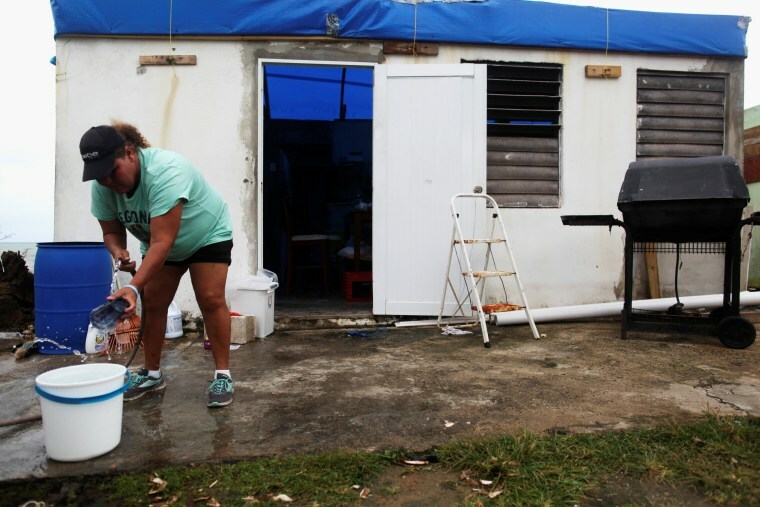 Puerto Rico municipalities have not gotten back as much as they invested in FEMA, she said. San Juan has given FEMA $20 million to care for people in the capital city and received $4.9 million back, she said. Rep. Nydia Velazquez, D-N.Y., who also spoke at the summit, said she and other members of Congress are demanding that help continue. Puerto Rico was hit Sept. 20 by Hurricane Maria, a Category 4 hurricane that was packing 155 mph winds when it made landfall. The storm thrust the island into darkness. The Trump administration has been criticized for its slow response and for underestimating the magnitude of the storm's destruction. About 35 percent of the island still lacks power, four months after Maria hit, longer in places that were hit by Hurricane Irma on Sept. 6. Puerto Rico reports 96 percent of the island has water, but there are questions about how much of it is potable.